Cliff Mass Weather and Climate Blog: Are Cold Waves Increasing Under Global Warming? The Answer is Clearly No. Are Cold Waves Increasing Under Global Warming? The Answer is Clearly No. The coldest temperatures of the winter have hit the central and eastern U.S. and misinformation about its origin is now spreading around social and traditional media. 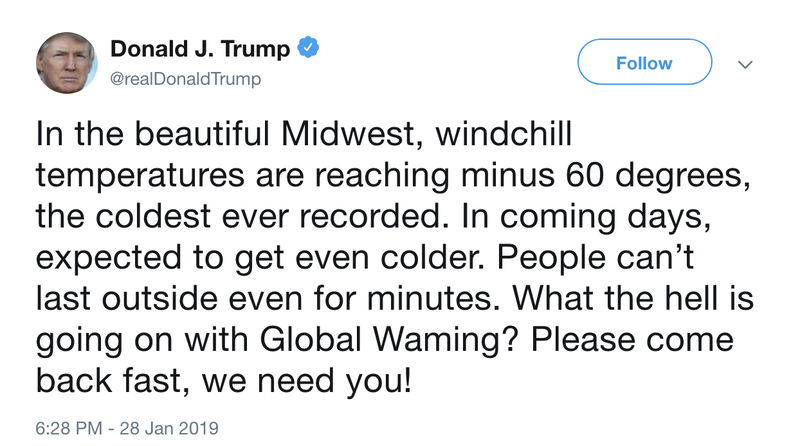 President Trump, of course, tweets about the cold wave, suggesting that global warming has left us, and hopes for its return. Absolutely untrue. A cold wave, such as the one hitting the U.S. says nothing about the existence of global warming caused by increasing greenhouse gases. And then a number of supposedly reputable media outlets, such as the NY Times and the WA Post, that are giving play to the hypothesis that global warming is causing more cold waves, through the "lazy jet stream" mechanism pushed by Dr. Jennifer Francis of Woods Hole and Dr. Judah Cohen. of a private sector firm, AER. These claims are clearly false: the observational evidence is very clear: there are LESS cold waves today than in the past. Which is exactly what we would expect in a warming world. 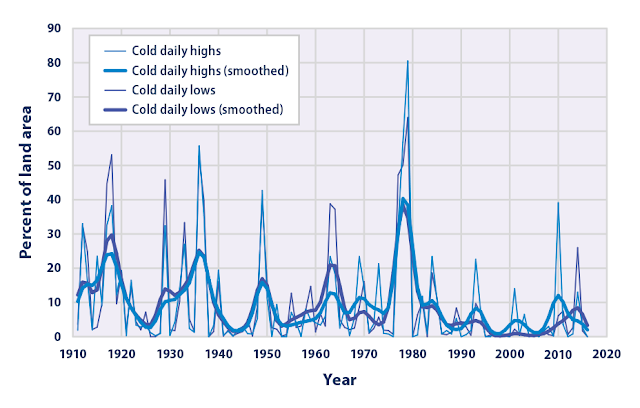 Global warming is NOT causing more cold extremes, it is doing the OPPOSITE. Let me show you analyses produced by U.S. government experts. 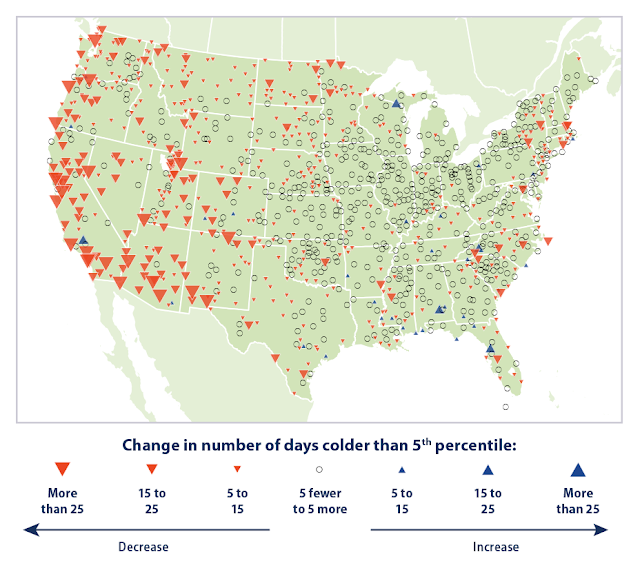 The U.S. Environmental Protection Agency did a study of the trend of cold wave days from 1948 to 2015. The found very few locations where cold waves were becoming more frequent, but lots of locations in the western U.S. and the East Coast where cold waves were become less frequent, with the West Coast showing a huge decline of cold waves (see below). A plot of the area in the U.S. covered by extreme cold over the past century (again by EPA) shows a decided decline in cold daily lows. What about statistics from NOAA? Here is a plot for the National Climate Data Center on the changes in winter cold extremes over the U.S. 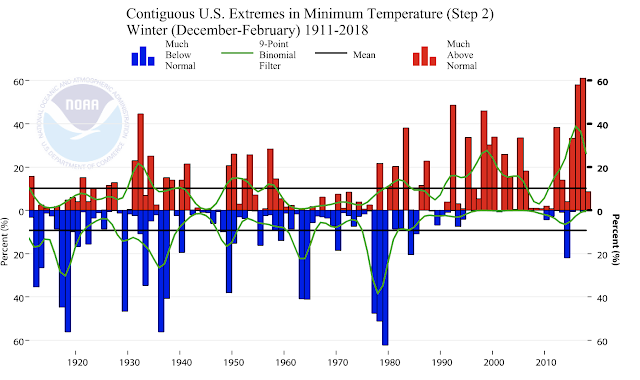 The minimum temperature extremes are warming, not getting colder. Extreme cold waves are weakening. 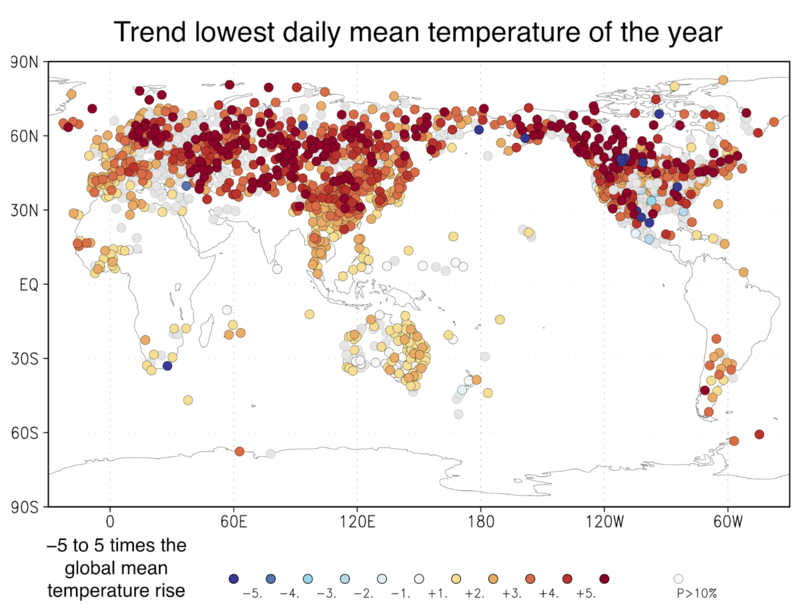 Trend in the temperature of the coldest day of the year as a multiple of the global mean temperature rise. Source: NOAA/NCEI/GHCN-D stations with at least 50 years of data via the KNMI Climate Explorer. I could show you much more, but the facts are clear. 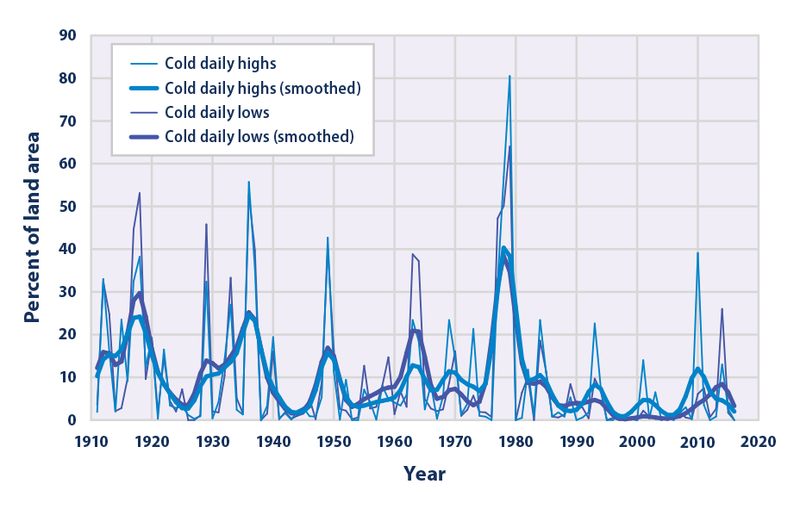 There is no increasing trend in cold waves as claimed in the NY Times and other media. Observations demonstrate that cold waves are declining in magnitude as the Earth warms. This makes complete physical sense. Global warming is preferentially warming the Arctic and northern latitudes, the source region of the cold air that moves southward in cold waves. And there is little evidence for the "lazy jet stream" theory in observations. I for one find it really disturbing the such obviously false information is being communicated by major media outlets. I live in Spokane currently, but was born in Seattle. As many of the old timers remember winters from the 50`s to 1971 almost always had some of artic blast that Bob Hale would say was coming down the Fraser River canyon. As a kid growing up in Seattle we new it time to get ready to play in the snow. Then came 68-71 years. It stayed cool in the summer and winter was cold and snowy. I my opinion, the temp of the Pacific dropped and maybe it made it easier for cold air to migrate to the ocean when the Artic oscillation and the PNA went negative. I n Spokane, the last time we had any major artic blast was winter of 1999/2000. Since then we have not had any major blast where temps would go from mid 40`s down to single digits in a few hours. During this time the Pacific has warmed significantly and in my opinion, this is why we no longer see these extreme temps on the west coast. I completely agree, see my post at https://www.worldweatherattribution.org/trends-in-weather-extremes-february-2018/ (please credit the last figure to that post), and previous analyses of cold waves on that site. But, but, but, I read several chicken little scare stories in the media about climate and if we just stop using all fossil fuels and shutdown our economy we will be fine. Great data, thanks. If the number is not increasing, as would be expected in climate change science predicated on warming being the primary deviation from natural activity, is the severity of the cold snaps changing? In other words, even though we are getting fewer cold snaps is the temperature in those remaining cold snaps more extreme? Is the question whether cold snaps/extremes are increasing in frequency or whether the specific pattern where weak or slower jet stream winds are allowing a polar vortex to dip into the lower latitudes? The NYTimes article I read does not necessarily argue that extreme cold temperature are more frequent than they were, it just suggests this particular pattern is occurring more frequently. @David Miller. I think the NOAA graph shows this is not the case. 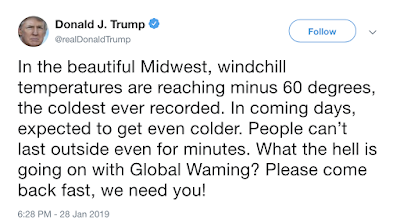 You hit another prediction on the head last week... Trump's reaction to the cold. It's not just his hands that are small, what with his confusing weather and climate and wishing for the return of global warming, which he claims is fake anyway. But I have to say... it didn't take a PhD to make this prediction. There are only a few things in the world which never, ever disappoint. Trump is one. Great post, Cliff, but I still see some wiggle room for the lazy jet stream idea. For example, there could be a 2% increase in a pattern that brings cold air south, but that air, on average, could be several degrees warmer than in the past. Less cold snaps in the west. That agrees with my general (unscientific) impression. Hence more pine beetles, more dead trees, more fires. Pretty soon I won't even need to cover my grapefruit tree. 2) trends in the latitudinal positions of the upper level air patterns. I believe that these are the primary "extremes" that many scientists, not just Jennifer Francis, are talking about, not the temperatures. I have yet to see any of them claim that temperature anomalies are getting colder..... although they do say the anomalies are getting hotter. Ya know Cliff, I appreciate the fact that you want people to be more scientific in their response to Weather and or Climate Change. However, we are talking about the SURVIVAL OF OUR SPECIES. And right now no one, no one, is doing a damn thing about it. So sounding an alarm, any alarm, does not seem like a bad idea to me. Even if it's overstated. I don't know if you have kids, but if I was a parent of young children these days, I'd be scared shitless. So a little panic is excusable, IMHO. We count on you to deliver the facts, Cliff. It does make common sense as well. Thanks for coming through for us again. It's true that the midwest cold snap is not unusual, and snaps like this happened many times in the period 1970-2000, especially in the 70s, but seemed relatively rare since then. It's not clear exactly what the data are in your plots, tho they suggest warming of the lows. I'm not sure exactly what numbers were used to get those bars/points/etc. In fact, the evidence of global warming is that this cold snap is considered so unusual. I remember temperatures in the -20's Fahrenheit in Northern Illinois as a child. Happened a few times per decade. Yes, it was unusually cold, and people would remark about it. But trains still ran, the mail was delivered, schools stayed open, etc. It was considered within the normal parameters of what people should be prepared for as winter weather. Now you have lifelong Midwesteners, in their 20s and 30s, expressing surprise at how much snow squeaks when walked on in subzero weather. This is something that all children there used to learn by personal experience. Now it's unusual enough that people can reach adulthood before experiencing it. These changing personal and cultural reactions, and not the mere presence or absence of extreme cold, is the real evidence for global warming. One thing I think is missing from this conversation is how has the standard deviation from the mean changed? What about this at specific latitude ranges? Cliff - This is 21st century America... No one is interested in scientific facts. I will provide the following scientific evidence for this claim: The Donald is the President of the United States. Kinda ironic expressing concern about major media outlets spreading misinformation after posting a Donald tweet. As to teeny weeny kids now, maybe the notion of "changing baselines" will have them not so distressed about the weather and effects when they are in their 30's since all they knew as little kids is yet to come. Hopefully many accommodations will be in place by then. David B - good post. I grew up in the Midwest too and no big deal was made of challenging weather. Back then people were of a different character and did not need to "tweet" exaggerations nor were they obsessed with themselves as they are today. People simply went out and got things done. Dear America, what happened to you? When I was a kid back in the 60's it wasn't uncommon for us to have our 150' diameter pond freeze over solid enough for a week or so each winter we could walk on it. This is western Lewis County. Today January 30th, my lawn is still green and the pond has not seen more than a skiff of ice in more than a decade. This is long term observation of the same isolated place unchanged except for the passage of time. Anyone could see the Donald was BS-ing. I've done the same, on NOAA wx radio. But I began my career in the late 70s -- see those spikes on the timeline? That was my welcome to the science. My last winter in northern Minnesota was 1996, the year this outbreak is being compared to. I think it got to minus 60 at Leech Lake dam that year, absolute calm in a low spot at dawn. If you look you'll find cameras at Duluth Harbor, the lake boils when it is this cold. Several generations that have never had to experience true adversity and are addicted to the endless dopamine of perpetual manufactured positive reinforcement. Every day is an endless stream of participation trophies and echo chambers full of affirmation from the like minded. Yes, the 2008 crash was humbling but it was not true life or death. We also have a President whom has never been told "No" in his life so doesn't know the definition of the word. Thus, temper tantrums and bluster in face of information presented by professionals who don't need to boast of being a "stable genius". Well, there may very well be true adversity on the horizon, but you can't get it past anyone that it might be something worth pulling together for. just want to add more data link for the ocean heating idea for the major changes in the globe heating up. While I agree with you that extreme weather events are caused by anomalous weather patterns rather than by global warming, I believe that changes in the magnetic field are now a large part of the cause of weather patterns and are more significant in the longer term than manmade co2 in causing global warming. To the extent that recent weakening of the magnetic field results in ozone loss, increasing intensity of UV radiation adds to the rate of melting of the polar icecap. As UV exposure causes trees to die while intense UV radiation heats the land during summer in northern regions, increasing forest fires add co2 to the atmosphere. In addition, evidence from the Ibex mission indicates that the local fluff which the sun is now moving through is highly magnetized and that the sun will soon reenter the local bubble which is not magnetized possibly in less than 100 years. It seems likely that recent changes in the magnetic field of the earth and sun and other planets and the increase in the rate of motion of the magnetic pole and changes in the atmosphere of other planets are at least somewhat related to this. Such changes may also impact the position and stability of the polar vortex. When the sun reenters the non magnetized local bubble, the period of changing magnetic forces will eventually end and related UV intensity and global warming can be expected to decrease. While entering the local fluff about 40,000 years ago may be related to the end of the ice age as magnetization blocked cosmic rays, it seems quite possible that another ice age may occur as cosmic rays increase as the sun reenters the local bubble. Considering the strength of the magnetic forces which are changing and that only part of the recent increase in co2 is caused by humans, it seems that manmade co2 should not be too heavily focused on as being the cause of global warming. It would be great to have a president that understands science and knows how to spell. We used to see snow regularly with some serious accumulations. Now it is a rare event and we have daffodils starting to bloom at the end of January. For an area that is hardly seeing any effect from Global Warming there sure are a lot of red triangles on the map. Yesterday on PBS Dr Jennifer Francis of Woods Hole Research discussed the connection between global warming and polar vortex changes. She seemed receptive to some connection. The AGW Cult constantly does this, so you can quit the preaching and the trademark "progressive" smugness. However, we are talking about the SURVIVAL OF OUR SPECIES. And right now no one, no one, is doing a damn thing about it. So sounding an alarm, any alarm, does not seem like a bad idea to me. Even if it's overstated. TRANSLATION: Any lie for the "progressive" religion. Now you have lifelong Midwesteners, in their 20s and 30s, expressing surprise at how much snow squeaks when walked on in subzero weather. This is something that all children there used to learn by personal experience. Now it's unusual enough that people can reach adulthood before experiencing it. These changing personal and cultural reactions, and not the mere presence or absence of extreme cold, is the real evidence for global warming. B.S.! I grew up in Wisconsin. Winters always varied; some colder than others. Occasionally quite warm, and occasionally quite severe. More gernerally, if the ridiculously smug Seattle "progressives" don't like Trump, maybe they can convince their party not to veer off of the left side of the highway and instead cough up a candidate who a) makes any sense, b) isn't some superannuated nothingburger whose slogan is "It's my turn, you stupid jerks" and c) isn't despised by half the population. In the meantime, grow up. Is there no argument to say that, while we may be seeing average temps increasing, that our extreme weather (in both directions) is more extreme? I mean, we've broken so many heat and cold records across the nation in these extreme events in the past few years....isn't that worth taking into consideration or at least exploring? Not just cold/warm weather events, but also in major storms involving wind (hurricanes, typhoons, etc). Placeholder, it would be nice to have a decent moderate of either flavor. Someone who is willing to compromise and pay attention to facts/data as well as different view points, also backed up by facts/data. Science is not a "religion". Its only a methodology in which conclusions are objectively and empirically derived. Both the Reds and the Blues hate science at times, because it means they are not the headwaters of all that is delineated down to the masses. The voters, however, don't care about facts/data/science for the most part anyway. Its boring. It also requires doing their homework IE:thinking. What people want is someone who plays on their emotions. A policy crafter that tells them "I have the solution to your problems", when they probably don't have the first clue. Or the voters want someone to spoon feed them what their tribe represents. Again, no thought on the part of the voter required. Just wait for the guy that proclaims sympathy to the cause. Politicians reveal in that as its easy and mindless. Its gets their campaigns funded and those key elections won. Trump's campaign was supposedly a S-show but that's OK. He decided to just play on people's fears and anger. 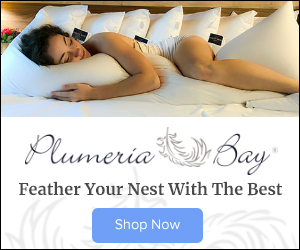 It works fine for product advertising. And baddahbing...here we are. Regardless of that, certain things are stupid that also contribute to what is warming the climate. Creating tons of plastic waste is one example, which ends up in the ocean. Ripping through finite resources like tomorrow never comes...also dumb. Lots of energy expended to extract, create, transport, market and than toss aside for the next shiny trinket. For what? To drive a constant growth economic model? Sustainability means.."Hey we want to have some of this stuff left for our kids kids perhaps". That includes resources and a planet that is still able to a good place to live. Or we can just let the party continue and let them figure out how to clean up the mess the proverbial next day. Then reality sets in. Cliff represents someone who deals with reality. If you want someone who deals in fantasy, talk to an economist. Or a politician. Whoops....that's a fake USHCN time series. So I just wrote a note to Senator Cantwell. I believe that our lack of investing in basic education is coming home to roost with the climate change issue. This and the fact that social media and the internet is a jungle of opinion unsupported by facts makes it extremely unlikely that we collectively will be willing to reduce our reliance on easy energy. We need to start working on mitigation strategies in case we don't want to give up our cars/warm homes/lights at night. As Cliff has pointed out in previous blogs that means we need to figure out where to build some new dams so that we have adequate drinking water when the snow stops falling in the middle altitudes. These projects take time to plan and execute. Red/blue I don't care. I am 63 years old and the world has gotten a lot warmer and it appears to me that the rate is accelerating. I don't care if it is magnetic flux or a species population that is far greater than is healthy for the biosphere given our species resource consumption habits. We need to adapt or die. It is the way of the natural world. I told Senator Cantwell that should be the focus of political leadership. I don't think we should give up on reduction efforts but we need to be planning and figuring out how to pay for mitigation . @BAMCIS, it's always fun to read the latest Seattle "progressive" idiocy. You write about tons of plastic waste ending up in the ocean. Which, of course, means that the virtue signalers of Seattle, who happen to hate the disabled and the elderly, rush to ban plastic straws. The reality is that there's more trash in the ocean because your precious Third World has had huge growth in cities next to the oceans, and have been dumping crap in the oceans. No matter! You're a "progressive," and you have a desperate an insatiable need to show yourselves how Good you are, no matter what the impact on the people you hate -- the elderly and disabled. Question yourselves? Never! Why? Because you are Good, and no one but yourselves and your hive mind has ever once mattered to you. Moving on, Trump. Yep, I get it. You are outraged that the Wrong Guy won. You hate it. Rather than ask yourselves just why you rallied around an arrogant, corrupt, superannuated old hag who was justifiably despised by half the country, you will inject Trump into every single conversation. Why? Because you have an insatiable need to display your Goodness. Do you people EVER get tired of yourselves and your smug arrogance, and self-aggrandisement? EVER? Good God, we can smell you from 200 miles away. I am generally confused by all of this. The polar vortex theory seems reasonable and there is a lot of information published by NOAA that supports it. However, the graphs the Cliff posted seem to dispute this claim. I would like to read a response to this article from the polar vortex collapse people. I did an internet search but I could not find anything. If anyone has leads please post them here to share. Thanks! Jonathan, the link below is to an article about how recent changes in the earth's magnetic field could cause changes in weather patterns. 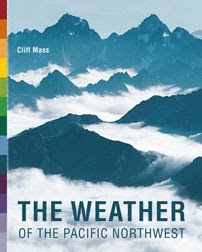 The article discusses possible mechanisms related to such changes which seem to provide a more plausible explanation than that a change of just over a degree in temperature could largely in itself cause significant changes in weather patterns. Recent major changes in the atmospheres of other planets also support the possibility that changes in weather patterns are related to changes in the magnetic field.